This question really is so important and only very few in the whole of mankind can understand it thoroughly! Why mankind defies God so wildly has become headline news, and the historical tragedy of the incarnate Christ being nailed to the cross is being played out again; is this not a fact? Let us read some passages of the Scripture. The Lord Jesus said: “And this is the condemnation, that light is come into the world, and men loved darkness rather than light, because their deeds were evil. For every one that does evil hates the light, neither comes to the light, lest his deeds should be reproved” (Jhn 3:19–20), “If the world hate you, you know that it hated Me before it hated you” (Jhn 15:18), “This is an evil generation” (Luk 11:29). The Bible says, “The whole world lies in wickedness” (1Jn 5:19). We didn’t quite understand these words when we read them in the Bible before. Only when we see that both God’s incarnations have suffered the coordinated condemnation, hunting and suppression of atheist governments and the world of religion do we understand that these words within the Bible are indeed true. Mankind’s doings and the attitude they take in their approach to Christ are adequate proof that the entire world is completely under Satan’s control and within its grasp. Nowadays, most of us can see clearly that the majority of religious pastors and elders are all people who defy, condemn and deny Christ, and that the world of religion long ago came under the control of these hypocritical Pharisees and antichrists. Therefore, when God incarnate manifests and works, those people are the first to rise up and condemn and defy Him—this is inevitable. The CCP government is a satanic regime that most hates the truth and defies God, and it has always arrested and persecuted Christians. When Christ came in the last days, manifesting and doing His work in China, the CCP government unscrupulously and savagely tried to hunt down, intercept and exterminate Christ, creating a stir across the entire world. This fact completely fulfills the prophecy of the Lord Jesus: “For as the lightning, that lightens out of the one part under heaven, shines to the other part under heaven; so shall also the Son of man be in His day. But first must He suffer many things, and be rejected of this generation” (Luk 17:24–25). God has been incarnated twice amongst man to speak and work, to redeem and save mankind, both times suffering the coordinated condemnation, blasphemy, pursuit, and suppression by religious leaders and the ruling party; this fact is enough to prove that this world is a terribly dark and evil place and that mankind has been corrupted so deeply! Mankind has been corrupted and degenerated to the point that they have become sick of the truth, they hate the truth, they hold evil in high esteem and set themselves against God, becoming Satan’s kind and becoming Satan’s progeny, simply unable to tolerate the very existence of God. 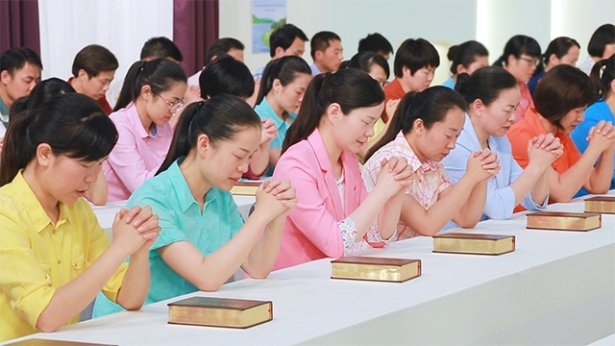 The manifestation and work of God incarnate must therefore inevitably suffer persecution and rejection. As to why mankind defies God, Almighty God has fully revealed this aspect of the truth; we will be clear on this once we have read a few passages of the words of Almighty God. “The source of man’s opposition and rebelliousness against God is his corruption by Satan. Because he has been corrupted by Satan, man’s conscience has grown numb, he is immoral, his thoughts are degenerate, and he has a backward mental outlook. Before he was corrupted by Satan, man naturally followed God and obeyed His words after hearing them. He was naturally of sound sense and conscience, and of normal humanity. After being corrupted by Satan, his original sense, conscience, and humanity grew dull and were impaired by Satan. Thus, he has lost his obedience and love toward God. Man’s sense has become aberrant, his disposition has become the same as that of an animal, and his rebelliousness toward God is ever more frequent and grievous. Yet man still neither knows nor recognizes this, and merely blindly opposes and rebels” (“To Have an Unchanged Disposition Is to Be in Enmity to God” in The Word Appears in the Flesh). “Satan corrupts people through the education and influence of the national governments and the famous and great. Their nonsense has become man’s life and nature. ‘Everyone for himself and the devil take the hindmost’ is a well-known satanic saying that has been instilled into everyone and has become people’s lives. There are other words of life philosophy that are also like this. Satan uses each nation’s fine traditional culture to educate people, causing humanity to fall into and be engulfed in a boundless abyss of destruction, and in the end people are destroyed by God because they serve Satan and resist God” (“How to Know Man’s Nature” in Records of Christ’s Talks). “From when man first had social sciences, the mind of man was occupied by science and knowledge. Then science and knowledge became tools for the ruling of mankind, and there was no longer sufficient room for man to worship God, and no more favorable conditions for the worship of God. The position of God sunk ever lower in the heart of man. A world in man’s heart with no place for God is dark, empty without hope. And so arose many social scientists, historians, and politicians to express theories of social science, the theory of human evolution, and other theories that contravene the truth that God created man, to fill the heart and mind of man. And in this way, those who believe that God created everything become ever fewer, and those who believe in the theory of evolution become ever greater in number. More and more people treat records of the work of God and His words during the Old Testament age as myths and legends. In their hearts, people become indifferent to the dignity and greatness of God, to the tenet that God exists and holds dominion over all things. The survival of mankind and the fate of countries and nations are no longer important to them. Man lives in a hollow world only concerned with eating, drinking, and the pursuit of pleasure” (“God Presides Over the Fate of All Mankind” in The Word Appears in the Flesh). “No one actively seeks out God’s footsteps and the appearance of God, and no one is willing to exist in the care and keeping of God. Instead, they wish to rely on the corrosion of Satan, the evil one, in order to adapt to this world, and to the rules of existence that wicked mankind follows. At this point, the heart and spirit of man have become man’s tribute to Satan and become Satan’s foodstuff. Even more, the human heart and spirit have become a place in which Satan can reside and its fitting playground. Thus does man unknowingly lose his understanding of the principles of being human, and of the value and meaning of human existence. The laws of God and the covenant between God and man gradually fade away in man’s heart, and he ceases to seek or pay heed to God. With the passage of time, man no longer understands why God created him, nor does he understand the words from the mouth of God and all that comes from God. Man then begins to resist the laws and decrees of God, and his heart and spirit become deadened … God loses the man that He originally created, and man loses the root of his beginning: This is the sorrow of this human race” (“God Is the Source of Man’s Life” in The Word Appears in the Flesh). Almighty God has spoken exhaustively on the sources and current state of mankind’s corruption. When we read the words of Almighty God, we gain some understanding on issues such as why there is so much darkness and evil in the world, why mankind so fanatically resists God, and what is the truth and essence of mankind’s corruption by Satan. The evil and darkness of these times serves to prove that mankind has been thoroughly corrupted at the hands of Satan—how many among mankind are there who thirst for God’s appearance and welcome His coming? How many are there who love to hear God’s word and accept the truth? How many are there who study and seek God’s work of the last days? The majority pay these things no mind, but they actually listen to the rumors and lies of the satanic CCP government and work with Satan’s forces to resist and condemn Almighty God. These are facts that everyone clearly understands. Even though there are many people with faith in God, how many are there who can accept the truth, pursue the truth, and truly submit to God? If we recall the time when the Lord Jesus appeared to do His work, all of the Jewish people followed the chief priests, scribes, and Pharisees to resist and condemn the Lord Jesus. In the last days Almighty God has appeared to do His work, and the majority of pastors and elders in the religious world are now resisting and condemning Almighty God; they are even going so far as sealing off their churches and not allowing believers to study the true way. This is sufficient evidence that this world, this era is so full of darkness and evil. The people are bored of the truth and they hate the truth; they have forsaken God and chosen to stand against Him. The root of this darkness and evil of the world is that Satan has all of mankind under its control, and the entire world is under its thumb. Over the last several thousand years, Satan has used atheism, the theory of evolution, and materialism as well as other harmful teachings and fallacies to deceive and corrupt mankind. This has led mankind to worship and put blind faith in various lies and fallacies of the kings of devils and “great men,” who have said things like: “There is no God or Savior”; “Man can conquer nature and fight against Heaven and earth”; “One’s destiny is in his own hand”; “Everyone for himself and the devil take the hindmost”; “Those with brains rule over those with brawn”; “Money makes the world go round”; “I am my own lord throughout heaven and earth”; “As a small mind makes no gentleman, a real man is not without venom,” and so on. Mankind has been deceived and corrupted by these evil teachings and fallacies which have made people arrogant, treacherous, selfish, greedy and wicked; there is no man who can speak of humanity and morality, no man who can speak of conscience and reason, and no man who can speak of being honest. In order to seek fame, prominence, and honor, men fight each other like dogs; they scheme against and cheat one another, and even kill one another. Nation fights nation in unceasing conflict—is this not the result of Satan’s corruption of mankind? These facts show that mankind has been thoroughly corrupted by Satan and has become the ilk of Satan, the descendants of Satan. Mankind has become an evil force that stands in enmity against God. For this reason, when God twice became flesh to speak and do His work among men, corrupt mankind resisted, condemned, and rejected God on both occasions, even going so far as to crucify Him. These are some of the facts behind why mankind has resisted God. The Chinese Communist Party’s (CCP) demented suppression and attacks against Eastern Lightning have created a stir world-wide. Many people have no insight as to why they are so frenziedly resisting and opposing God. It is precisely because the incarnate Almighty God has uttered many truths in The Word Appears in the Flesh and it is this book that has shaken every religion and denomination. Many who believe in the Lord have heard Almighty God’s utterances and affirmed them as the voice of God and as His work, and they have turned toward Him. The constant increase of those who proclaim and bear witness for Almighty God has caused the CCP to panic. The CCP has arrested countless numbers of those who have borne witness to God in their evangelizing, and has confiscated many a copy of The Word Appears in the Flesh. They research this book day after day, and increasingly feel how very formidable it is. It has the capability to conquer all; no matter how the CCP tries to slander, to judge and discredit Almighty God, they dare not make The Word Appears in the Flesh known to the public. That is, they make not the slightest mention of what Almighty God has uttered. Why are they staying so cool in response to The Word Appears in the Flesh? They fear the whole world will see that God has manifested doing His work in the East, that the Savior of mankind has appeared in the East, and that there lies the hope of mankind. Why does the CCP fear mankind reading The Word Appears in the Flesh? Because this book is the utterance of God, it is the expression of the truth, and it is true light that has appeared in the East! The CCP is the regime of Satan who is the most evil of all and most hateful of the truth. It fears most of all that the truth will come into man’s world, that mankind will accept the truth, that God will take power as King to rule man’s world, and that the kingdom of Christ will appear on earth. Thus, the CCP so dementedly pursues and represses Christ, and uses the media networks for propaganda to wantonly frame, falsely charge and discredit The Church of Almighty God. They do not even spare mobilizing the nation’s armed police force to overwhelmingly suppress, arrest and persecute God’s chosen ones. With nowhere to hide, His chosen ones have been forced into exile because of the CCP’s persecution, and the Chinese government under the CCP has stretched out its evil hand into every country abroad and utilizing political, economic and diplomatic means puts pressure on some of them to have those Christians who have escaped abroad extradited back to China in order to torture and persecute them. Even more detestable is that the CCP also arrests and persecutes the relatives of those Christians who have gone abroad and treats them as hostages with which to threaten The Church of Almighty God. It forces them to get their passports to go abroad and disrupt The Church of Almighty God in every country, and attempts through diplomatic channels to frame and entrap His church, to mislead by rumor, to manipulate public opinion and discredit it. The CCP incites both the governments and people of other countries to oppose and reject The Church of Almighty God, and to extradite the church’s overseas members; its evil aim is to succeed in obstructing, restricting and suppressing the spread of The Church of Almighty God and its gospel work abroad. Would you not say that the CCP is the devil Satan who hates the truth and hates God? The CCP is expert in the cruel abuse of people and the devouring of souls; it is a demon that eats men without spitting out their bones. Now all of you see here the true picture of why the Chinese government under the CCP so dementedly resists and condemns Almighty God. Previous：Question 37: For the last two millennia, the entire religious world has believed that God is a Trinity—the Trinity has been a classic theory of the whole of Christian doctrine. So does the interpretation of the Trinity really hold up? Does the Trinity really exist? Why do you say that the Trinity is the religious world’s greatest fallacy? Next：Question 39: We have seen a number of speeches online from the Chinese Communist government and the religious world that malign, slander, attack and discredit The Church of Almighty God (such as the “May 28” incident in Zhaoyuan, Shandong province). We also know that the CCP is very skilled at telling lies, fabricating things, and skewing the facts to deceive the people. It is also very good at maligning, attacking and judging those nations it is hostile to, so anything the CCP says is absolutely not credible. However, many of the things said by pastors and elders within religious circles are the same as what the CCP says, so how can we really have discernment on the rumor and slander spread by the CCP and the religious world? How should one practice and enter into being an honest person? You must be honest, and must pray in order to rid yourself of the craftiness in your heart. As you use prayer to purify yourself whenever needed, and use it to be touched by the Spirit of God, your disposition will gradually change. ...Would you say that it is a good thing to be an honest person? It is good to be an honest person. In the Age of Grace, the demons went away from man with the laying on of hands and prayer, but the corrupt dispositions within man still remained. ..Has man received complete salvation? No! Therefore, after that stage was complete, there is still the work of judgment and chastisement. This stage makes man pure through the word so as to give man a path to follow.